I am working in healthcare and I have a new colleague, a robot. As technology advances the work environment is changing with it. Increasingly robots are being used in the healthcare sector. Some say that with this change all our jobs will be lost. This opinion is not without reason. I mean… a robot does not sleep, a robot does not eat, you don’t need to pay a robot and a robot does not have prejudges as humans normally do. So why not replace this more demanding force, people, by a more stable and cheaper option? Well… even though the advantages of robots are great, the human touch will always stay relevant in the digital health sector. Therefore they will not replace us, instead we should be ready and prepared to work together and take advantage of these metallic allies. If doing so the before impossible can become possible. Therefore below I have explained some relevant and beneficial examples of the collaboration between humans and robots. Surgery is not the most pleasant experience. Mostly recovery is painful due to the size of the operating wounds. However the daVinci robot has the capacity to make smaller and more precise incisions, decreasing recovery time. The surgeon is in complete control and daVinci shows him the way through greater reach, flexibility and the high definition three dimensional camera. A collaboration benefiting all parties involved. Nurses, who have the most interaction with patients, are often overwhelmed by physically and mentally daunting tasks, resulting in an unpleasant experience for everyone. 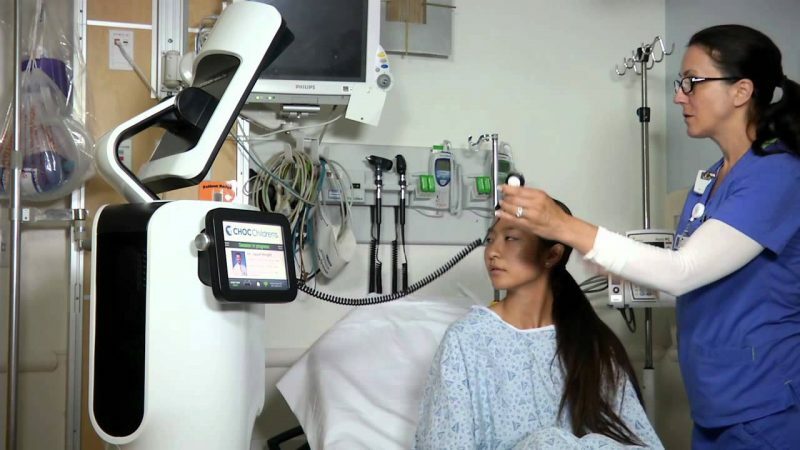 That is why robotic nurses are now designed to carry out the repetitive tasks so that human nurses have the opportunity to focus their attention to task that require human decision making and empathy. “You have seen them in movies, taken advantage of them in video games and now they are here for real: exoskeletons.” – (medicalfuturist, 2017). These devices can help paralyzed people walk, help with the rehabilitation when having a stroke or spinal cord injury and can enhance strength when a nurse needs to lift an elderly person for example. Currently they are still very costly to make and power, but with technology progressing it won’t be long before these amazing tools are available for everyone. Another great example is Xenex the disinfectant robot. 1 in every 25 patients in US hospitals gets a hospital associated infection, 1 out of 9 of these patients die. The Xenex disinfectant robot quickly cleans any room or space with high intensity ultra-violet light. This light damages the microorganisms therewith decreasing the number of hospital acquired infections. The origami robot, is a very small robot. When swallowed it can bring specific medication to the designated destination or remove a swallowed item from the stomach such as a small battery for example. Most microbots ideas are still theories, but there upcoming fast and when they do, healthcare possibilities will be endless. All the above are examples of robots performing task that humans cannot or where robots support healthcare providers to operate in a more efficient and effective manner. There are many more examples and even though change is often scary, robots in healthcare could do so much good; “bring medical care to regions where even today there is none to be found; to make the production and distribution of pharmaceuticals cheaper and more efficient; to lighten the load of medical professionals; to help people walk again.” – (medicalfuturist, 2017). To pluck the fruits of this development and avoid any dangers it is important that we stay well aware of these developments, understanding them and preparing for the new work environment to come. Working together is key. This article is based on the following post: Robotics in Healthcare – Get Ready!